It’s not the end - it’s the start of something awesome! We are excited to announce the Uncommon League to provide an even more amazing training experience in Agile, Lean Six Sigma, Business Architecture, Project Management, and much more. The Bob the BA Business Analyst certificate, Agile, Techniques, and Leadership courses are moving to the Uncommon League. 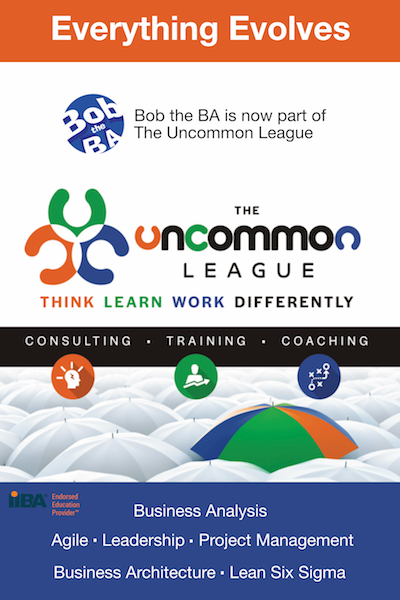 Together Bob the BA and the Uncommon League bring a whole new exciting course catalog. This will bring even more options for your training experience. Public courses, customized enterprise solutions, and pre-recorded video on demand training. Plus free one hour symposium presentations that dive deeper on topics in Agile, Business Analysis, Lean Six Sigma, Project Management, Leadership, and Business Architecture. We’re so excited to bring you new amazing training in 2019. Look for announcements on all the amazing new instructors teaching our courses! Don’t worry - Bob the BA is still here and a big driving force in the Uncommon League. This isn’t the end - it’s a whole new beginning! Check out our 2018 Schedule - 2019 courses will be published soon!